The Samsung Moment is also known as SPH-M900. 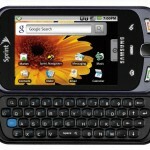 It is a smartphone manufactured by Samsung which uses the open source Android operating system 1.5. The phone is available in the United States. The Samsung Moment is the first Android phone trying to be special purely through hardware. It’s got a really rich AMOLED display, a gigantic keyboard, an 800MHz processor which is the fastest processor for any android phone and it’s on Sprint’s sturdy 3G network. The phone features a 3.2-inch 16M-color AMOLED capacitive touch screen and a 3.2 Megapixel autofocus camera with LED flash. The AMOLED display has some amazing features in some aspects, it’s incredibly saturated, and it makes other Android displays look pale and washed out. The screen is comparatively smaller to the other iPhones but large enough to allow comfortable navigation. But in a change from other Android phones, the display offers some of the best feedback for the virtual keyboard and keypad. The Moment’s keyboard is spacious and comfortable and we can text quickly without making any mistakes. The display rotates mechanically when the keyboard is opened. 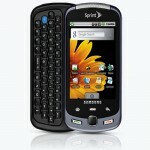 Software wise, the Samsung Moment offers a package of Mobile Google services which includes Google Search, Gmail, YouTube, Google Calendar, and Google Talk. It has a 800 Mhz processor. It has a huge memory of about 16GB, that is, 1GB internal and 15 GB external. The Samsung Moment is larger than the other samsung phones and its color scheme and soft touch material on its battery cover put it more in line with the Hero. The result is a that the Samsung Moment has a rather unremarkable design, particularly when compared with its Android counterparts, but it has some smooth lines give the Moment a minimalist appeal. The Moment is also quite heavy but the trade-off is a solid device with a sturdy build. The slider mechanism is found to be sufficiently stiff and the handset has a firm feel at the hand. Our reviews on the Samsung Moment has many good as well as bad features. The good are – It has a bright display with a spacious keyboard. The productivity features are plentiful and call quality is very clear. The bad are – The Samsung Moment’s touch interface and controls are slightly sluggish. The camera lacks editing features after the image is taken. The call volume could be louder, and speakerphone quality is just about average. Overall, with its full keyboard and bright display, the Samsung Moment successfully rounds out Sprint’s Android offerings. It is a fantastic phone and all the users would love it! !